Fellow Vapors, Do you believe you have what it takes to design a grand e-Cigarette? Do you have experience in 3D design tools such as CAD, 3DS? We are presenting all designers and engineers an opportunity to work with us and in turn, you will be able to create your own e-Cigarette signed in your name and of course, payment is involved. We are looking to cooperate with engineers all around the world. Send us your design and we will discuss your designs among our team and our manufacture key players. This is not a contest, but a real opportunity to create something amazing. At Kangertech, we believe in the smallest precise detailed designs with an array of complex proportions to present a meticulous and elegant touch for every hand and eye. We believe in giving an opportunity to those of whom having a dedication to their designs, and a purpose of creating something extraordinary. That starts with finding those who understand their own motive. We want to start a community of designers and engineers all over the world and provide them with a team and manufacture who knows how to get things done. 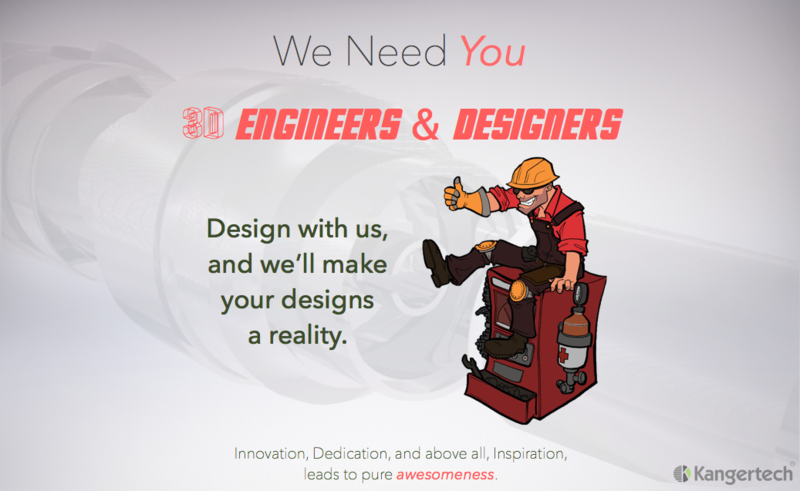 We are looking for talented and passionate 3D designers and Engineers. Specifically, those of who have much experience from draft to final production. (This is due to the fact that we are working from a huge distance.) If you do not have much experience as this, but you do have a passion to create innovated designs, we will put you to the test. We accept all sincere applications and hope that we are able to build a strong cooperation with you. In addition, those who already have their own brand, there is also a potential cooperation that we can discuss. • Translate concepts of aftermarket automotive appearance and performance parts from sketches, orthographic drawings, or provided 3D into full production ready 3D models in Solidworks, Pro-E, or other similar solid modeling programs. • Mate 3D models with source car data to ensure function and fitment. • Create quick 3D sketch models to evaluate potential designs or fitment issues. • Prototype models using a variety of rapid prototyping methods. • Understand a variety of manufacturing processes. • Ability to build 3D models that meet the requirements of a variety of manufacturing processes. • Problem solve design/modeling issues and provide a variety of quality solutions.